The death of cinema was the subject of intense theoretical concern in the final years of the twentieth century and beyond. The impending approach of the millennium as well as the 100th anniversary of film encouraged either an anguished, hesitant, or jubilant acknowledgement of the ephemeral nature of the medium. New developments in digital technology, changing patterns of image production and consumption, the decline of importance and interest in film as a social and cultural phenomenon, the vanishing horizon of film history, announce a crisis, perhaps fatal, in a certain idea of Cinema. In Histoire(s) du cinéma 1(a) (1988), Jean-Luc Godard famously compares the screen to a shroud. The hidden secrets of language confirm his claim. Cinema, it seems, shares a metaphorical bond as well as a metonymic affinity with its immediate linguistic neighbour. The next entry in the Thesaurus of Microsoft Word, “cinerarium”, describes “a place where the ashes of a corpse are stored.” If language is structured like the unconscious, to invert Lacan’s formula, then the return of the repressed takes the form, in Godard’s late films, of the gas chambers and ovens of Auschwitz. To this list, Nora Alter adds that Godard is in mourning, not only for himself and “the spectre of cinema,” but also for the lost possibility of art and the demise of European culture. For the purposes of this essay, I will limit myself to the most controversial of Godard’s claims – the failure to represent the reality of the camps – and to the most commonplace evidence of his own existence as a mortal being – the image of his body as it approaches old age. The presence of the one recalls the absence of the other. Nora Alter explains how Godard “insert[s] himself, his mortal corpse, into the history of film,” thereby conflating the story of his own life with the death of cinema. Similarly, Godard exhibits the signs of aging, the living proof of his own inevitable end, as a displaced testament to the memory of the victims of the Holocaust. If cinema did not fulfil its duty, he alone will bear the burden of responsibility. In order to understand the terms and conditions of Godard’s exceptional commitment to “show” an image of Auschwitz, I will view his films, particularly JLG/JLG (1994), in the light of the writings of Jean Améry. Améry’s reflections on old age and his experience of the Holocaust help to clarify Godard’s thoughts and feelings about death and the end of cinema. Jean Améry was born Hans Mayer in Vienna in 1912. As a member of the Resistance, he was tortured by the Gestapo and sent to Auschwitz as a Jew. Twenty years later, he wrote the essays published in West Germany as Jenseits von Schuld und Sűnne (Beyond Guilt and Atonement) and translated into English as At the Mind’s Limits. It was not until the 1990s that his withering testimony on the Holocaust became available in France as Par-delà le crime et le châtiment, along with his other texts on aging and suicide which together form, as Irène Heidelberger-Leonard states, “an intellectual biography of the twentieth century,” remarkable for its personal and analytical integrity. Améry died by his own hand in October 1978. Resistance without any confidence that it will be effective, resistance quand même, out of a principle of solidarity with the victims and as a deliberate affront to those who simply let the stream of history sweep them along is the essence of Améry’s philosophy. After Auschwitz, remembrance and reconciliation offer an impoverished response to the existential dilemma of the Survivor. The healing power of memory or the hope for justice in the future can offer no possible solace. Vigilance, resentment – “the emotional source of every genuine morality, which was always a morality for the losers” – and an undying commitment to the truth of his experience at Auschwitz, define the condition of Améry’s life. To my knowledge, Godard quotes Améry only once, as we shall see later, but, whether unconsciously, intentionally or coincidentally, he returns over and over again to the same subjects in his late films, albeit from a different perspective and position, and, along with Améry, lays great stress on the traces of violence left upon the body, mind and memory by a catastrophe that threatens to annihilate one’s sense of self and trust in the world. Améry too, in exemplary fashion, takes his own life as model, method and material for a final reckoning with time and history. Godard has always appeared in his own films but, as he has aged, his reflections on the history of cinema have been directed more and more through the medium of his own body. Throughout his career, he has cast himself in a variety of roles which range from the playful and the parodic, the militant and didactic, the comic and the critical, the poetic and prophetic. He took his first walk-on part, an innocent piece of Hitchcockian tomfoolery, in Breathless (1960). He interviews workers and students as a politicised radical after May 68 (Loin du Vietnam) and conducts a series of pedagogical experiments and enquires into consumer society and contemporary media (Numéro deux (1975), Ici et ailleurs (1976)), often framing himself as the model of an engaged filmmaker at work on his material in the studio or on the set, a scenario later repeated, as we shall see, with a more reflexive gesture in Historie(s) du cinéma (1988-1998) and JLG/JLG. He showcases his hidden talents as a slapstick comedian in Soigne ta droite (1986), leaping through an open car window with the physical dexterity and grace of Buster Keaton or falling flat on his face like a deflated Jerry Lewis. As he approached sixty, the image of JLG himself came to embody his vision of film as a funerary art, an art bound up with the passage of time, memory and death. His work takes on an elegiac tone and his presence, stooped, silent, alone, conveys a painful sense of melancholy and loss. Film has become the sole substance of his life. He identifies himself increasingly with the very subject of cinema. Histoire(s) du cinéma is both threnody and eulogy to the great directors and films of the past, to the follies and failures of the most popular art of the century, to the betrayal of cinema’s vocation and its abdication in the face of the catastrophe of History. Finally, it serves as a personal love letter in the form of a funeral oration for a man with an extraordinary passion for film. Godard’s body and voice, his image, his stories and memories, his life and films, incarnate the (un)dying spirit of the history of cinema which passes like all temporal things. Long ago, in a first fond adieu to the nouvelle vague, Godard, not without sardonic humour, had Fritz Lang perform a similar function in Le Mépris (1964). Godard depicts the legendary director, veteran of the golden age of silent film in Germany and the studio system in Hollywood, as an old man, a disillusioned Tiresias, herald of film history as Gotterdammerung. Lang plays the part of a modern Homeric sage, bard of cinema’s fallen destiny, cynical, bored and more than a little redundant. The assistant director who shoots the actual scenes of the movie version of The Odyssey that Lang is filming is none other than Godard himself, appearing in yet another cameo, a behind-the-scenes portrait of the artist at work. In his films, Godard, like Odysseus, seeks to return to the homeland, to find a place on Earth, a world of his own that remains true to the name of Cinema. Godard mourns both for his own mortality and for the ultimate fate of cinema. The rhythm of his breathing, the grain of his voice, whispering, croaking, trembling, its silences and sudden outbursts, the sure or sketchy gestures of the hand that writes or slowly spools or unspools a roll of film, the shuffling gait of the solitary walker on the shores of Lake Geneva or on a wintry mountain path, suffuse his late films, notably Historie(s) du cinéma and JLG/JLG, with a mortal sadness. 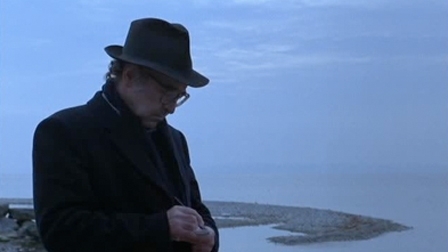 In Germany Year 90 Nine Zero (1991), Godard laments the sad fate of the lost and lonely old man, out of touch with reality and left high and dry by the tide of history. Godard, “an old hand at giving cinema a body,” as Michael Witt observes, casts Eddie Constantine as the film director’s surrogate, his “ageing and ill body … called upon to represent ‘cinema’ at the beginning of the 1990s.” Lemmy Caution is the fictional counterpart of the narrator of Histoire (s) du cinéma: the Last Man surveying the wreckage of History, condemned to survive as a character in his own story, to endlessly retell the tale of his own woeful existence. Constantine reprises his role as Lemmy Caution from Alphaville (1965), only to return, after a lifetime of exile at the movies, in the guise of a superannuated secret agent. The film is set in the last days of the Cold War. The Berlin Wall has fallen. The Soviet Union is on the brink of collapse. As the film begins, a car runs over the street sign for Karl-Marx-Strasse which lies, along with a bedraggled bunch of flowers, on a rain soaked pavement. Mr Caution has no alternative but to embark upon a philosophical-picaresque road trip in search of the West. Along the way, he encounters a series of literary and historical figures and visits a number of monuments and sites dedicated to the memory of European culture. Godard transforms the wintry landscapes and industrial zones of Europe into a post-apocalyptic wasteland. A monstrous creature from an ancient bestiary, Constantine drags his stiff and swollen body across big empty fields and vacant lots toward what elephants’ graveyard … A disoriented and exasperated old man, he surveys the neon-lit streets and the bustling nightlife of Berlin in despair, before arriving at his final resting place, a suite in a luxury hotel, where a maid, recently arrived in the West, tells him that “Arbeit Macht Frei.” The traces of memory have been obliterated but a spectre is haunting Europe: Auschwitz. Mr Caution’s last words are: “Les Salauds.” Bastards! Améry also describes the equally devastating effects of what he calls social and cultural aging. The World no longer recognises the private significance, the historical importance, the meaning ascribed to people, places and things (art, political action, love, work, friendship) which defines a man or a woman’s life as they grow older. At every turn, the experience of aging is denied. The feeling of alienation, rejection and incomprehension explains Godard’s appearance and attitude in Histoire(s) du cinéma and JLG/JLG, as well as Lemmy Caution’s aimless existence in Germany 90 Nine Zero. Godard’s crankiness and weariness, his self-obsession and disillusionment, his mordant wit, but most of all his solitude, in these late films represent the last defences of the elderly artist or intellectual. He invents a persona that corresponds with his own sense of redundancy. For Godard, the famous 80 year old film director, the history of cinema is the story of his life. Its value is essentially his very raison d’être. His later work stands as a defiant monument to his passion for film. It is aimed, in his eyes, as an act of resistance not only against the decline and fall of cinema as a vital cultural, social and artistic force, a fact bound up with the diminished capacities of his own body, his flagging will and failing spirit, but, above all else, as the ultimate gesture of revolt against any final compromise with death. But the presence of death and disaster also reveals itself like a dark omen from the depths of time that returns to haunt the living. In JLG/JLG, Godard discovers the originary appearance of catastrophe in an image from his own childhood. For Godard, the figure of the Lost Boy and the Last Man, forsaken emissaries from a forgotten time and place, represent the abandoned hopes and dreams of a world bereft of cinema and blighted by the disastrous passage of History. The opening sequence of JLG/JLG stages the mise-en-abîme structure of Godard’s memory theatre. From within the darkened chamber of the camera obscura, a spacious and secluded room in his studio/home in Rolle, Switzerland, Godard recreates the primal scene of cinema. Shadows enclose the frame in a lattice-work of bars and bands. The familiar silhouette of the filmmaker, shot from behind, occupies the foreground of the image. His figure partially obscures a black and white portrait of a young boy. The camera slowly glides toward the picture, skirting behind Godard’s back and shoulders, and comes to a halt, hovering expectantly on the threshold of the room. In the meantime, the tracking shot – for Godard, as we know, always a question of morality – has expanded the limits of the frame and drawn attention to the focus of the shot. The photographic reproduction of young Jeannot – for it is he – is now in the centre of the screen. To the right, the indistinct but unmistakeable outline of a small video camera is also visible. Godard, it is now evident, has been filming the image of his childhood self, “moi-même, mon propre et unique companion.” He leans over to look through the lens and blocks out our view. Film is an art of projecting shadows as much as light. 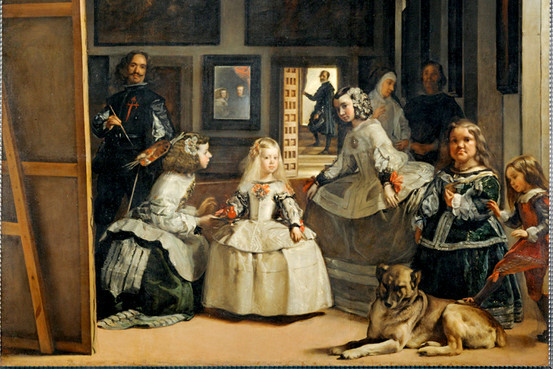 JLG/JLG begins with the same recursive gesture as Las Meninas, the famous painting by Velasquez. Likewise, over the course of the sequence, Godard’s reflexive framing induces a feeling of conceptual/percetual vertigo in the spectator. Where Velasquez stands in front of his canvas, Godard turns his back on the screen. While Las Meninas inscribes its implied viewer within the scene, JLG/JLG addresses an imagined audience beyond the frame. Either way, both the subject and object of the gaze occupy an uncertain position in relation to each other. Artist, image and spectator exchange places in a closed circuit of looks and mirrored reflections. Godard films himself filming a copy of an image from his childhood. Jeannot faces the camera, the model for a photograph, a video, or a film portrait. Which image do we see? were entitled to lay claim to him. Man and boy share the role of exorcist, demon and victim. Who possesses who? The hours when the melancholy story of my life was not yet melancholy, and its sad outcome was still undecided and indeed could hardly be anticipated – those are my finest hours, and it is my right, as a failure [my italics], to remember them. Only in the past do I recognize myself again. Améry’s words echo the fatalistic tone of Godard’s parting address to the doomed little boy in the photo. The search for lost time begins and ends with failure. There is no escape from our ultimate destiny. The subtitle of JLG/JLG – Autoportrait de décembre – places Godard in the venerable tradition of old masters such as Rembrandt and Goya. The artist and his medium become the subject for a profound meditation upon the experience of being and becoming old. Godard films the opening scene of JLG/JLG from the perspective of death. The screen acts as space and support for a contest over the very soul of cinema. Jeannot stares back at the camera with a premonitory gaze like the herald of a future catastrophe or the victim of some ominous fate. His innocent gaze already appears shrouded in a nimbus of loss. Godard suggests that “my slightly distressed look in the picture” is “because I had bent the rules of some imagined Last Judgment.” Death is hanging over him. The double perspective of JLG/JLG now becomes apparent. The World lies open before the boy, Jeannot. His future, his life, his very self will be actualised, externalised, will exist as a positive and potential movement into space, as Améry puts it, the space of the living. Godard refers to this possibility as Hope. But the aging film director, the old man, JLG, plunged in the gloom of its orbit, knows that Time annihilates the gift of a human life. It will literally, in Améry’s words, “de-space” us. Godard even believes that his twin, his childhood self, senses the presence of the dark powers (puissances tenebreuses) which grant him life, feels within himself the totally negative capability of death, nothingness, to annul experience and existence, and, for this reason, draped himself in mourning long before his time. Godard uses the photo of Jeannot again in Histoire(s) du cinéma 3a as the central image in a montage sequence that commemorates the Liberation. Jeannot, his face silhouetted against a background of red, white and blue, presides over the rehabilitation of France. the little boy “Jeannot” in the portrait resembles the photograph of another little boy that Godard returns to in his Histoire(s) du cinéma, a Jewish boy, from the Warsaw Ghetto, his hands raised before a German rifle, sure to be transported to the death camps and murdered. The famous picture of the boy from the Warsaw Ghetto, which appears toward the beginning of Histoire(s) du cinéma 4b, resonates across the films with its fraternal twin. The principle behind Godard’s entire project oscillates between these two images. I know now what voice it was that I might have wished to precede me … [I am speaking] in this place where I used to listen to him and where he himself is no longer present to hear me. The traumatic impact of the Holocaust is experienced as a disembodied act of ventriloquism. To paraphrase Youseff Ishaghpour, one can no longer tell whether Godard is speaking to or through the image/text or whether the image/text is “speaking” him. He is haunted by Jeannot and his Jewish double just as Cinema is haunted by the memory of the Holocaust. Little Johnny Cinema shoulders the burden of shame and assumes the role of sacrificial lamb for, amongst other things, as Histoire(s) du cinéma, the companion piece to JLG/JLG, endlessly proclaims, the failure of cinema to keep its promise, to bear witness, above all else, to the trauma of the Holocaust. Jeannot and the little Jewish boy might have found an unlikely playmate in Edmund, the hero of Germany Year Zero (Rossellini, 1947), whose confused mind struggles to free itself from the grip of the Nazi past. Godard ends the first episode of Histoire(s) du cinéma, 1(a), with Edmund’s suicide. His leap into the void occurs shortly after one of the most discussed scenes from Histoire(s) du cinéma: the montage sequence of a young and beautiful Elizabeth Taylor in A Place in the Sun (Stevens, 1951) and harrowing footage of the dead and dying from the concentration camps. Godard’s preoccupation with memory and mortality is posed provocatively as a metaphorical engagement with the Holocaust. Historie(s) du cinéma, JLG/JLG and Germany Year 90 Nine Zero perform the difficult process of mourning-work (trauerarbeit) for Godard, for cinema, for the Holocaust. It most certainly seems presumptuous, outrageous even, to equate one’s lost youth, one’s life-work, one’s art with the horrors of the Final Solution. Godard adopts this perverse strategy as a means of reconciling the personal encounter with death and the final account with History. He appropriates the discourse of the Survivor in order to redeem the lost cause of Cinema. … that part of his life was not his own anymore. His knowledge of that time had been stolen from him by cinema newsreels showing horrors to a large and horrified audience before showing an enjoyable feature film, by newspaper articles, by countless books about hell, the hell of Belsen, the hell of Mauthausen, Buchenwald, Gross-Rosen, Auschwitz, Ebensee, the hell of Derloven. As Heidelberger-Leonard continues, films, the primary vehicle of a sensationalist mass media, had “`stolen’ [his] personal property from him.” The documentary footage from the camps, which Godard holds out in Histoire(s) du cinéma as the saviour of cinema during the war years, has merely substituted a falsified picture for the terrible reality of the Holocaust. A true image can barely be imagined. When it’s all over, nothing is the same. Violence leaves a deep scar. A trace of the oblivion always remains. The trust in the world that terror destroys is irretrievable. Violence severs the life line. L’outrage de l’anéantissement est indélébile. The shame of destruction cannot be erased, as the line is translated in the English edition of At the Mind’s Limits. The first line of the quotation – Lorsque tout est passé, rien n’est plus comme avant – recalls the comment by the historian Norbert Frei about the Auschwitz trial in Frankfurt in 1963: “nothing was as it had been before.” With this event, the floodgates of memory were opened and the Germans were forced to confront the process described by Alexander and Margarete Mitscherlich in Die Unfähigkeit zu trauren: the “inability to mourn”. The “traces of oblivion” must be recovered. It is from this date that Améry decided to set down the definitive account of “his Auschwitz” in the essays, originally broadcast as radio talks, published as At the Mind’s Limits. Here, in Sarajevo, the one place in Europe, as a character in the film says, where reconciliation seems possible at the present moment, Godard invokes Améry in an effort to confront the outrage of annihilation and to challenge the unendurable legacy of violence. It’s clear that Jeannot, like JLG, has been touched, marked in advance, by the indelible scar of a close encounter with death and disaster just as the Jewish boys of his youth were consigned to wear the Yellow Star. The slippage of terms from torture to violence to terror and trauma, from mourning and melancholy for a lost childhood to remembrance and responsibility for mass murder, from the story of a life to the narrative of History, remains complete. But Notre Musique shifts the terrain and changes the tone of Godard’s long dark night of the soul as represented in the Histoire(s) du cinéma films, JLG/JLG and Germany Year 90 Nine Zero. He discards the persona of solitary poet and sage, guardian of cinematic memory, and drops the personal voice of autobiography and philosophical reflection. The discourse on aging and the Holocaust, so often conflated and collapsed into a single jeremiad against the injustice of death, is displaced toward another source of discontent. The same story is repeated yet takes on a different meaning. Notre Musique poses a controversial solution to the problem of Israel and Palestine that inverts the premises of Améry’s ethical stance on the responsibility of the Germans for the crimes inflicted upon the Jews. In a cruel twist of fate, Améry’s philosophy of resistance and resentment in the face of a terrible reality supplies Godard with the model for a parable on the politics and history of the recent peace process in the Middle East. His ambiguous attitude toward “the impossibility and necessity of being a Jew,” to borrow the title of an essay by Améry in At the Mind’s Limits, is dramatised in the figures of Judith and Olga in Notre Musique. Judith, a young Jewish journalist, seeks restitution for the past by interviewing a comrade of her father’s, now Ambassador in Sarajevo, who faced deportation in the French internment camps. He prefers to ignore her request, maintaining the silence sanctioned by the State about the fate of the French Jews. She searches for reconciliation in the present by conducting an interview with the Palestinian poet Mahmoud Darwash which she hopes to publish in the Israeli press. Olga, a descendent of Russian Jews, who is about the same age as Judith and looks like her sister, takes a different course. In a suicidal gesture, she takes hostages in a Jerusalem cinema and threatens to blow herself up. The audience is given five minutes to leave. She will die happy if a single Israeli joins her to die for peace, not war. No-one accepts the offer. Olga is shot. Instead of a bomb, her bag is found to contain books. His resentments are there, he explains, so that the crime may become reality for the criminal. Resentments are not to be confused with a desire for revenge or with atonement, he continues; they insist solely on recognition. But if, in the midst of the world’s silence, our resentment holds its finger raised, then Germany, as a whole and also in its future generations, would retain the knowledge that it was not Germans who did away with the dominion of baseness … the overpowered and those who overpowered them would be joined in the desire that time be turned back and, with it, that history become moral. If this demand were raised by the German people…it would have tremendous weight, enough so that by this alone it would already be fulfilled. Only then can the number tattooed on the arm of the victim or the survivor be erased, only then can the infamy and atrocity committed by the victors be eradicated. The unresolved contradictions in Godard’s own position toward the fate of the Jews and the legacy of the Holocaust become apparent to the extent that he has read Améry’s moral imperative against the grain. Olga’s example shows, as Walter Benjamin attests, that History does not belong to the vanquished. The film’s epilogue, however, reveals the impasse into which it leads. If life on earth is a living hell, death appears to be an unreal dream, an imaginary vision of the Final Solution. Olga wanders through woods and streams to the shore of a lake. She enters a Paradise guarded by American Marines. The Promised Land holds the status of a camp. Zion and Auschwitz share the same space. JLG and Jean Améry must be thought together. Jean Améry’s reflections on the experience of the Holocaust, his life as a survivor and the inexorable advance of old age emphasise the dialectical tension of revolt and resignation. Godard’s elegiac meditation on the death of cinema in the films of his late period draws upon the same spirit of remembrance and resentment. The ravages of Time and the wreckage of History cannot be repaired through any act of forgiveness or appeal to reason. The films of Jean-Luc Godard affirm the moral imperative to resist in the face of the brutal force of mortality. Godard’s representation of the Holocaust in Historie(s) du cinéma has been the focus of significant critical attention and analysis. The best sources in English are Libby Saxton’s Haunted Images: Film, Ethics, Testimony and the Holocaust, London and New York: Wallflower Press, 2008, 46-67 and Allen Meek’s Trauma and Media: Theories, Histories, and Images, New York and London: Routledge, 2010, 163-170. Michael Witt, “The Death(s) of Cinema According to Godard,” Screen 40, 3, Autumn 1999, 346. Nora Alter, “Mourning, Sound, and Vision,” Camera Obscura 44, Vol 15, No 2, 2000, 94-95. Irène Heidelberger-Leonard. The Philosopher of Auschwitz: Jean Améry and Living with the Holocaust. London and New York: I. B. Tauris, 2010, 181. W.G. Sebald, “Against the Irreversible: On Jean Améry” in On the Natural History of Destruction. London: Penguin Books, 2004, 159-160. Jean Améry, At the Mind’s Limits. Trans. Sidney Rosenfeld and Stella P. Rosenfeld. Bloomington and Indianapolis: Indiana University Press, 1980, 77. Michel Subor is tortured in Le Petit Soldat (1962) and Godard himself is tied to a chair and viciously beaten in Changer d’image (1982). A pilot in Soigne ta droite (1986) reads the controversial text Suicide mode d’emploi and then tries to crash a planeload of passengers. 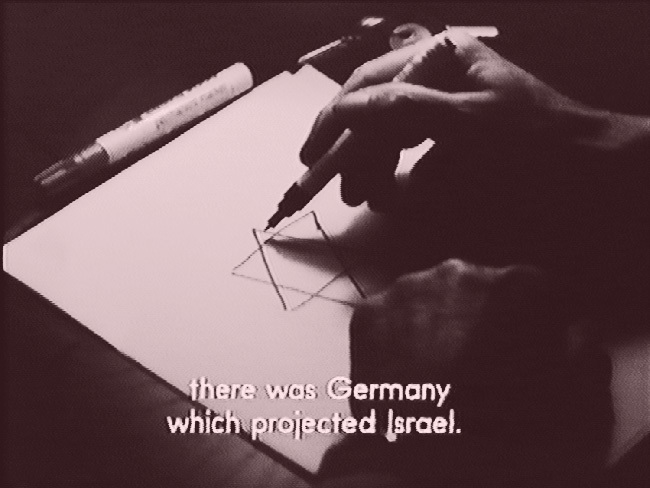 The Holocaust is central to Historie(s) du cinéma and Godard continues to provoke accusations of anti-Semitism in his public discussions on Israel and Palestine and in his debate with Claude Lanzmann over the Shoah. Other filmmakers have followed Godard’s example and used their ancestors as bearers of cinematic history and memory. Jacques Rancière draws the connection between Histoire(s) du cinéma and Chris Marker’s The Last Bolshevik where Alexander Medvedkin stands as a cipher for the artistic and political destiny of “an idea” of cinema and Soviet Russia (Film Fables. Trans. Emiliano Battista. Oxford and New York: Berg, 2006, 166). In a more direct act of homage, Wim Wenders and Jim Jarmusch have cast Nicholas Ray and Sam Fuller respectively as trailblazers of a certain tendency in American independent cinema. Witt, 33. Constantine was to die two years later. Jeffrey Skoller describes Monsieur Caution’s itinerary in “Reinventing Time: the Continuing Adventures of Lemmy Caution in Godard’s Germany Year 90 Nine Zero,” Film Quarterly, Vol 52, No 3, (Spring 1999), 38. He meets Dora and Lotte, the muses of Freud and Goethe, Don Quixote and Sancho Panza, a Russian sailor called Dimitri (after Shostakovich), Sophie Scholl and her brother. He passes a Gestapo Headquarters, Schiller’s house, Pushkin’s monument, a choir singing a poem by Brecht, the site of the murder of Rosa Luxemburg. Jean Améry, On Aging: Revolt and Resignation. Trans. John D. Barlow. Bloomington and Indianapolis: Indiana University Press, 1994, 14. Sam Rohdie, “Film and Landscape,” Screening the Past, 16, May 2004. http://www.latrobe.edu/screeningthepast/firstrelease/fr_16/sr2fr16.html. Accessed on August 15th, 2012. Jean-Luc Godard and Youseff Ishaghpour. Cinema: the Archeology of Film and the Memory of the Century. Trans. John Howe. Oxford and New York: Berg, 2005, 76. I have written elsewhere about this scene. See “Elizabeth Taylor at Auschwitz: JlG and the Real Object of Montage,” in J.S. Williams and M. Temple (eds. ), The Cinema Alone: Essays on the Work of Jean-Luc Godard 1985-2000. Amsterdam: Amsterdam University Press, 51-60. Heidelberger-Leonard, 64. As a journalist and cultural commentator, Améry wrote extensively about film and “had been passionately fond of the cinema even as a boy” (107). His articles have been collected in Cinéma. Arbeiten zum Film ed Joachim Kalka, Cotta’s Bibliotek der Moderne, Stuttgart, 1994. Sophie Raimond. “Sarajevo, entre traces matérielles, mémoire collective et construction d’un regard singulier: trois films-documents de Jean-Luc Godard.” http://www.cbfr.eu/?page_id=485 Accessed on August 17th, 2012. Thanks to Kathlyn Wiltshire for translation. Subtitles from Notre Musique. The English translation of At the Mind’s Limits explicitly refers to torture where Godard’s version speaks of violence. The passage reads: “Whoever has succumbed to torture can no longer feel at home in the world. The shame of destruction cannot be erased. Trust in the world, which already collapsed at the first blow, but in the end, under torture, will not be fully regained. That one’s fellow man was experienced as the antiman remains in the tortured person as accumulated horror” (40). Jean Améry. At the Mind’s Limits. Trans. Sidney Rosenfeld and Stella P. Rosenfeld. Bloomington and Indianapolis: Indiana University Press, n/d, 78. Améry felt solidarity for the Jewish state of Israel but was plunged into a state of turmoil by the events of the Six Day War, the student Left’s espousal of the Palestinian cause, and the hostage crisis at the Munich Olympics and Entebbe. Heidelberger-Leonard, 185-86.